See slideshow at bottom of original article. USA Today recently tagged Lima, Peru as one of "10 great places to get global vacation values." I was thrilled to see it mentioned because I fell under Lima's spell and it has lingered in my mind to become one of the highlights of my trip to Peru. Granted, our 2 a.m. drive from the airport to our hotel, through some seriously desolate parts of the city, wasn't a great introduction to the city (nor was our first night in a room with plywood nailed over the windows). The next morning, we stepped out into the city and discovered its ample charm. In Lima Centro, the Plaza de Armas is a great hub for relaxing and people watching--lots of locals hang out here, from families with frolicking kids to wooing young couples to shuffling old men. The plaza is surrounded on all four sides by scenic architecture like the Cathedral and Archbishops palace, the Palacio de Gobierno and tall, golden yellow buildings with colonial detailing. The cathedral is well worth a visit for its retablos (side altars), masterfully carved wooden chancel screen, and the artistic curiosities and treasures of its museum. In the morning, you can often find people around the plaza selling sliced fruit for a cheap breakfast. We had a concerned Limeña tell us that we were overcharged when we paid one sol (about $0.30) for each of our baggies of pineapple and papaya--she also berated the seller for not charging us the more standard price of 50 centimos. Despite the hair-raising warnings that I read prior to departure, Lima Centro was really quite pleasant for walking (although we made sure to not be too far from our hotel at night). It's easy to bounce from place to place and the churches in the area are astounding in all of their Baroque frothiness; in particular, the retablos are jaw-dropping pieces of craftsmanship that manage to overwhelm with their size, but also with their intricacy. The monastery church of San Francisco, La Merced, San Pedro and Santo Domingo were all unique and worth a visit. The central post office is an atmospheric, faded-grandeur sort of place from which to send out a postcard. If you're a cross between a museum buff and a cheapskate, you've got a conundrum in front of you: the Museo Larco. I can speak to you as one of your kind, though, and tell you that, yes, it is worth it to cough up the $10 entry fee, even in a country where not much other than hotels and transport costs above $10. And yes, you'll have to take a cab there. Still worth it, for the lush, flowery grounds and the spectacular collection of artifacts covering 3,000 years of pre-Colombian Peruvian history. The Museo Nacional de Antropología, Arqueología y Historía del Peru is another excellent option. It's laid out in a beautiful, sprawling house that was once the home of Peruvian heros San Martín and Bolívar, and features varied and interesting exhibits on its eponymous topics. Go in the morning and then venture out into the pretty neighborhood for a excellent, low-priced lunch in one of the nearby restaurants (about $5-10 for two people, if you order the special). Miraflores, is the hub of happening, upper-class Lima. It's hip and shiny and, yes, there is a Starbucks. But it still has plenty of character and appeal, with great restaurants (for all budgets), vibrant nightlife, unique shops and an abundance of hotels (even cheapies). The central Parque Kennedy is alive with strolling residents day and night and impromptu concerts by bands draw crowds. Vendors sell churros and sweets and cotton candy, and temporary markets are held there too (we happened upon a book fair). The Mercado del Indios is within walking distance, and it's a good place to pick up last minute souvenirs (read: there's a lot of of inauthentic stuff here, mixed in with some unique handicrafts). Miraflores is heavily trafficked by tourists, so be on your guard about rip-offs; there are plenty of over-priced restaurants but they're generally identifiable by being completely devoid of locals. Barranco would be a lovely place to stay, though it makes for a good day's outing, too. It's hub is the shady, Parque Municipal, and the tree-lined streets are ideal for strolling and looking up at the neighborhood's impressive houses. The Puente de los Suspiros is a feature of any Barranco walking tour; it stands over the Juan Parra del Riego Square and a pedestrian path the leads down to a lookout over the Pacific. There are some small museums in the area, like the Museo Pedro de Osma, which was unfortunately closed on the day I was there. If the exterior is any indication, the museum would be a great place to see a slice of colonial Lima. Since most flights to Peru from the United States arrive and depart from Lima, you've got a great opportunity to visit the city twice. 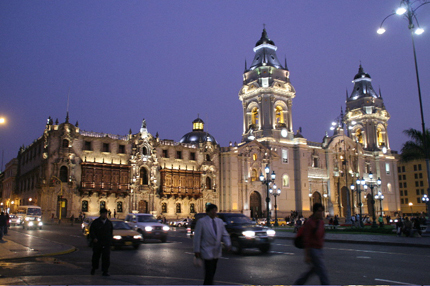 Stay in a different part of town each time to experience Lima's complex character--try starting out with a hotel in the historic center and come back for a more modern, cosmopolitan feel in Miraflores or Barranco. Taxis are cheap and readily available--actually, almost any car can be made into a taxi. Your best bet is to try to find one with official licensing and ID number (on the windshield). Taxis are not metered, so always agree on a price before you get in. Check with your hotel desk about average fares to the locations you want to go to. Most of the city's churches do not charge an entrance fee and are filled with art and items of historical significance. There is a fee (around $2) to get into the monastery and church of San Francisco, but it's well worth it. You can't really wander the place on your own--there are Spanish speaking guides that depart about every 10 or 15 minutes, and English guides that give a tour about every hour or so. Unlike a lot of museums that squirrel their vast collections away and have only a fraction on display, the Museo Larco has rooms packed to the brim with items--45,000 of them--that that would otherwise be in storage and out of sight. It's one of the highlights of the museum. There are lots of good hotel options at very reasonable prices in Lima. In Miraflores and Barranco, expect slightly higher rates, but even in those areas, hostels can be a great way to save money, and a number of them are recommended by guidebooks like Lonely Planet, Moon and Rough Guide. My personal experience with Hotel España in Lima Centro was good enough to recommend, but not top-notch. It's got quirky, colonial decor, with trailing plants and sculptures strewn here and there--but you'll want to ask to see a couple of rooms. The location and price were excellent (about $15/night for a double with bathroom), but the service was not as friendly as I experienced elsewhere. Hostal El Patio in Miraflores was excellent; friendly and helpful staff, top-notch location, a very comfortable room and tranquil atmosphere that's hard to find in hustle-bustle Lima. Their rates are going up in June, but until then, their rates for standard single/doubles are about $35/45. There are higher priced "standard plus" rooms and suites available, too. If you pay in cash, 15 soles (about $5) is taken off any room rate--a great deal! Peru's cuisine is steadily gaining recognition throughout the world for its quality and unique character. You can savor any national specialty somewhere in Lima's restaurant-packed streets. I've made note of Peru's amazing rotisserie chicken in the past, but it bears repeating. Look for the little places that are bursting with locals and avoid the tourist haunts, where you'll get charge exponentially more for a (possibly, probably) lesser product. Lima's oceanside location is ideal for fresh fish, which means there is outstanding ceviche to be had (Especially in Miraflores and Barranco). I had a particularly delightful rendition that was drizzled with a piquant-but-silken cream and chile pepper sauce. Keep an eye out for anticuchos de corazon (grilled beef heart skewers, tender and tasty); papas al a Huancaina (potatoes in a piquant cheese sauce); and, of course, cuy--stop thinking of it as a pet guinea pig and you'll find it quite tasty. If you're an ice cream addict, the D'Onofrio company (whose products you'll see all over the country) has a very Wonka-esque, enormous ice cream parlor in Miraflores. Order from the counter to save money; if you're seated, it'll cost more. The sundaes are gargantuan. Don't miss out on going to the grocery store--the produce is outstanding and makes an economical breakfast or snack. Mountains of tropical fruit and avocados the size of small children's heads? Yes please! Peru has, of all things, really excellent Chinese food. "Chifa," as it's been nicknamed is widely available and a great option for a tasty and cheap lunch or dinner.